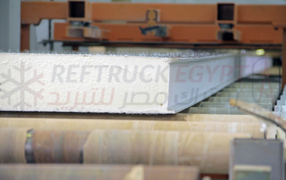 Reftruck Egypt is the innovator of seamless fiberglass insulated truck bodies. The body consists of two layers of polyester & multi layer fiber glass with stripes of polyurethane foam having a density of 42,5 kg/m3 in between. Both panels layers are compressed together with a solid conjunction in between to have one piece homogeneous panel. We are a leader in the manufacturing of laminated, insulated sandwich panels - a position which has been attained through a commitment to quality products at competitive prices, personal and efficient service, plus an ability to customize products for any application. 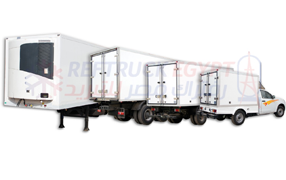 Reftruck Egypt maintenance center provides all the possible service capabilities in addition to its top notch technicians and engineers for a premium after sales services to all its products including : insulated boxes, refrigeration units and installed sandwich panels. 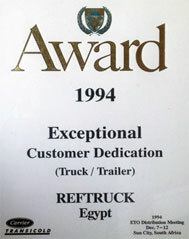 Reftruck was established in 1989 with a vision to introduce to the Egyptian market all its needs of insulation and refrigeration solutions for efficient transport and storage facilities that relies on innovation and customization. 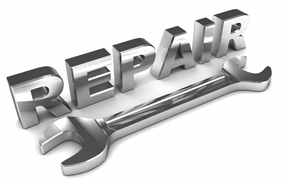 Copyright © 2014 REFTRUCK. All rights reserved.